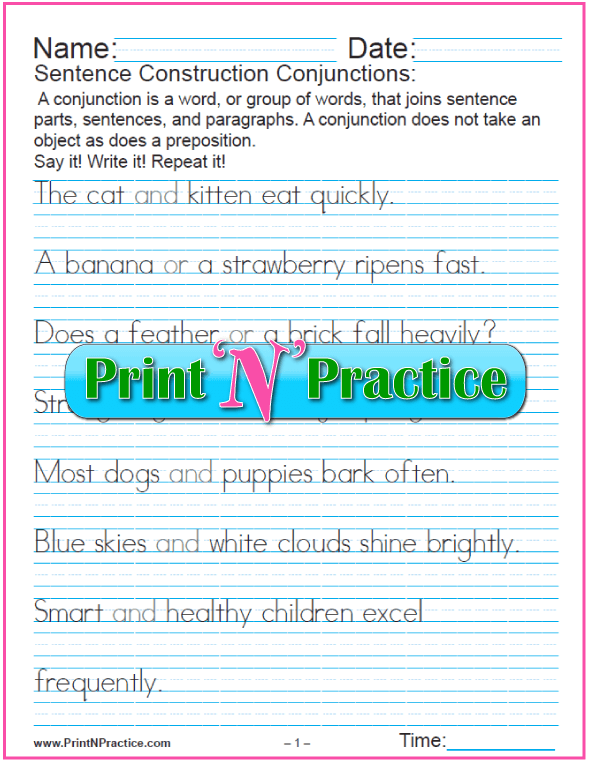 The first printable below is a list of conjunctions and it teaches the coordinating, subordinate, and correlative conjunctions. 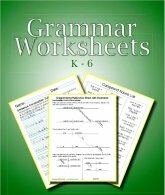 The two worksheets offer practice, one in manuscript, and the other in cursive writing. A list is super helpful for beginners both to understand the function and to recognize the actual words. ESL students need only translate to their own language. As with the English definition of many terms, descriptive words usually have the same definition or meaning that they have in other uses. If you recognize the base or root word of the grammar term you can figure its definition. Their functions are the same no matter what the newest text book calls it. Conjunction - A conjunction is a word, or group of words, that joins sentence parts, sentences, and paragraphs. It does not take an object as does a preposition. There are, generally, subordinating, coordinating, and correlative conjunctions (these last are the same as correlative coordinating). correlate means "with relation" and so on. Basically, the words mean what they mean in other uses. Subordinate Conjunction List - same as a Subordinating conjunctions. Under or lower order: These words join a dependent clause to an independent clause. At first this looks like a huge list of conjunctions; yet once kids understand that there's a joining and that these words make the rest of the phrase so it cannot stand on its own, it's easier for them to see the subordination because they can see the dependence on the main part of the sentence. A very good question is "Can the clause stand on its own?" If not, the first word is a subordinate conjunction. 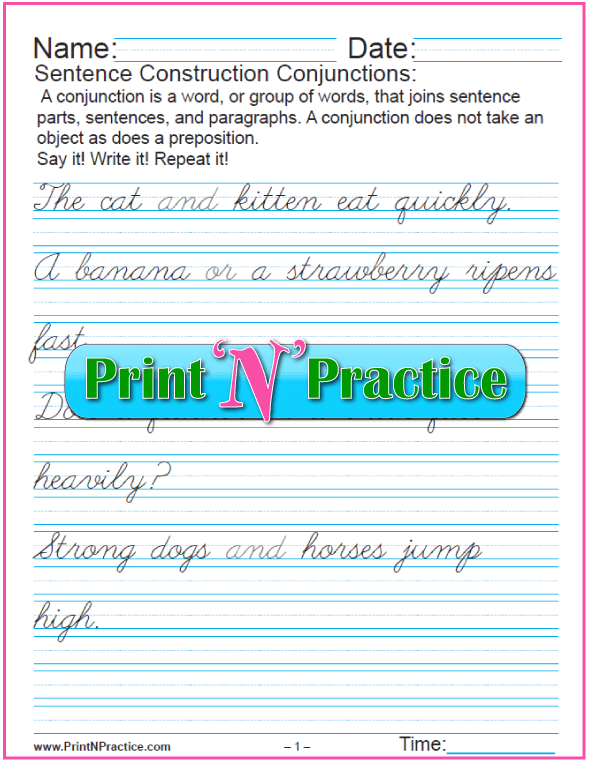 These conjunction worksheets use examples of conjunctions in a simple manner for beginners. The cat and dog are his. 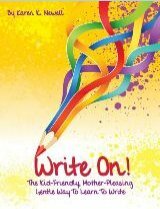 The first printable has two worksheets that can be printed back to back on two sides. The next has super simple sentences with basic conjunctions in light gray font. The last is the same in cursive writing, yet it runs to three pages. 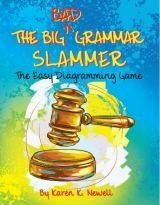 Sentence diagramming is easier when you can tell the difference between a simple sentence, a compound sentence, and a complex sentence. A list of conjunctions is a huge help with this. It's best to memorize it, yet usually repeating the list a few times is very helpful for recognizing them in sentences. Compound-complex sentences are easier to recognize, too. Get students familiar with the list of conjunctions to make it easier to recognize these kinds of sentences with their subordinate clauses. 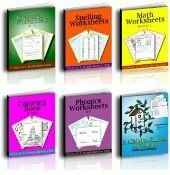 We have diagramming sentence charts and worksheets here that will let kids practice using conjunctions and help them "see at a glance" what conjunctions do. Diagramming is like having a road map to grammar.